First assignment in Anatomical Visualization taught by John Daughetry. 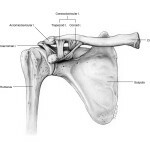 Anterior view – coracoacromial lig., acromioclavicular lig., and coracoclavicular lig. Posterior view – supraspinatus m., infraspinatus m., and teres minor m.
Process: Preliminary sketches were developed by transferring bone measurements from Plexiglass sheet (picture plane) with a divider to tracing paper. Ligaments and muscles were added by freehand drafting on an overlay tracing sheet. The sketches were transfered to Strathmore paper. The finalized drawings were scanned and labeled in Adobe Illustrator. References: Bones from bone box, shoulder models, anatomy atlas, text book, and the gross lab. Issues: Compositing from multiple sources with anomalies and inaccuracies resulted in awkward placement of the clavicle and the humerus in respect to the scapula, and inaccurate ligament attachments especially for the trapezoid lig. 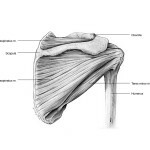 of the coracoclavicular lig. Lesson learned: Check multiple references, such as Grey’s Anatomy and X-rays to ensure precision.